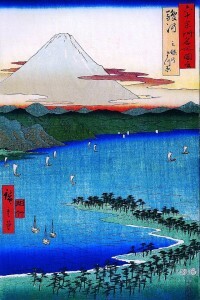 Mount Fuji sits on the border between Shizuoka and Yamanashi prefectures. It is surrounded by three small cities: Gotemba to the east, Fujinomiya to the southwest, and Fujiyoshida to the north. Outlet shopping in Gotemba. Photo. 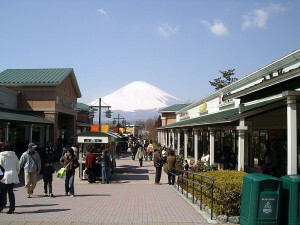 Gotemba is a popular shopping destination and has easy links to Yokohama and Tokyo by way of the Tōmei Expressway. Gotemba has a population of just over 88,000. 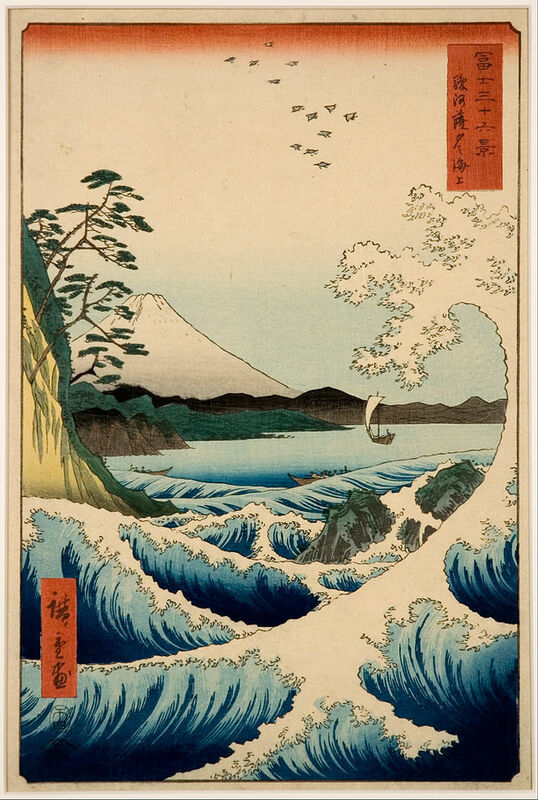 Suruga, by Hiroshige. Suruga was an old province corresponding to central Shizuoka today. Fujisan Hongū Sengen Taisha (富士山本宮浅間大社) was established as the Supreme Shrine of the Suruga Province. Photo. Fujinomiya has a population of nearly 132,000. It is associated with the Supreme Shrine (Ichinomiya, 一宮) of the region. 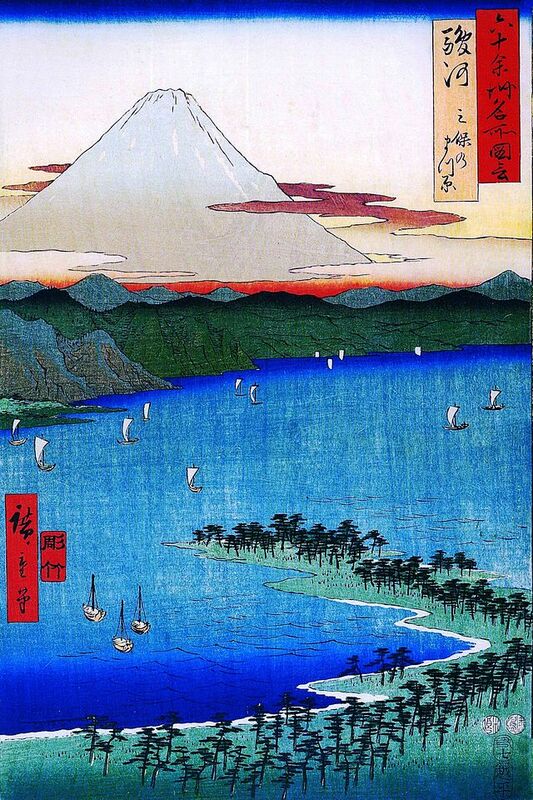 Sir Rutherford Alcock became the first non-Japanese to climb Mount Fuji starting from Fujinomiya in 1860. 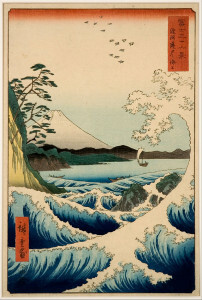 The Sea at Satta, Suruga Province, by Hiroshige. Photo. Fujiyoshida has a population of nearly 50,000. It was built upon old lava flows right at the base of Mount Fuji. 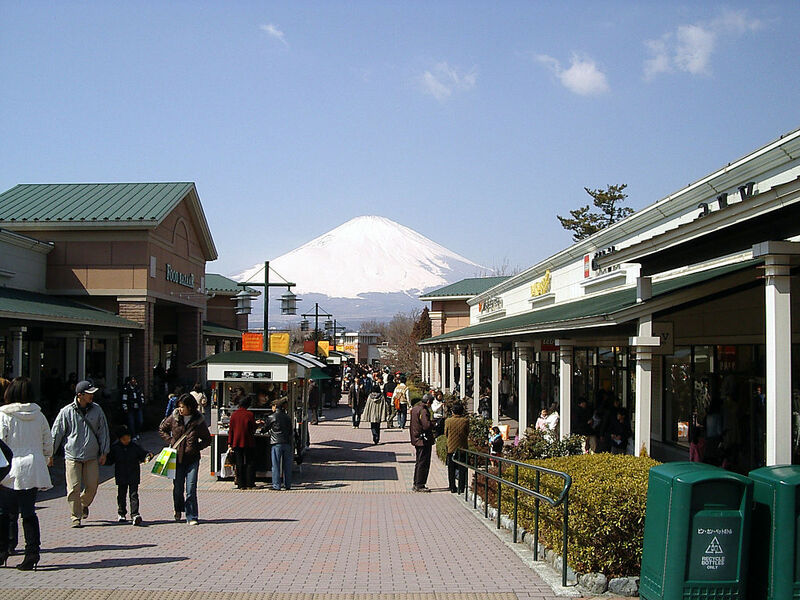 Fujiyoshida is the home of Fujisan Station and is also conveniently located between Kawaguchiko and Yamanakako. Fujiyoshida’s Kitaguchi Hongū Fuji Sengen Jinja, originally built in 788, is the historical starting point for pilgrims climbing the mountain. 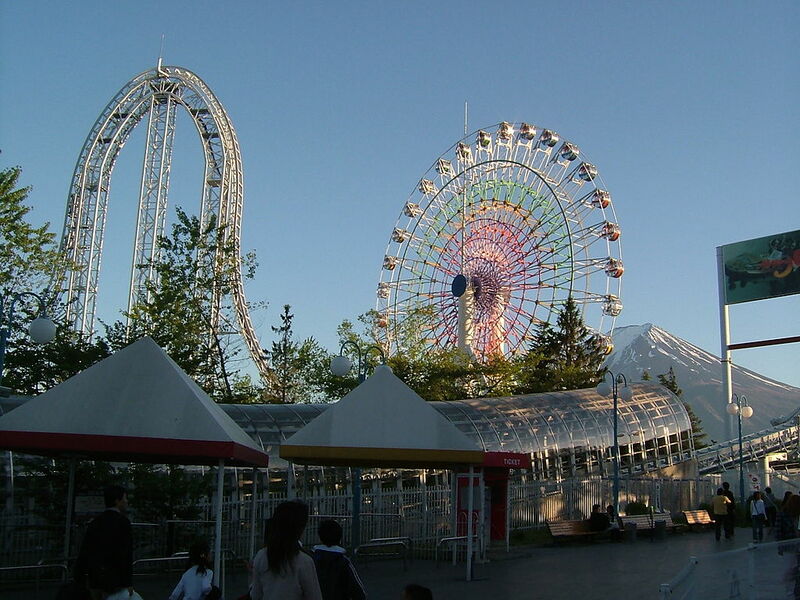 Fujiyoshida is also home to the Fuji-Q Highland amusement park. 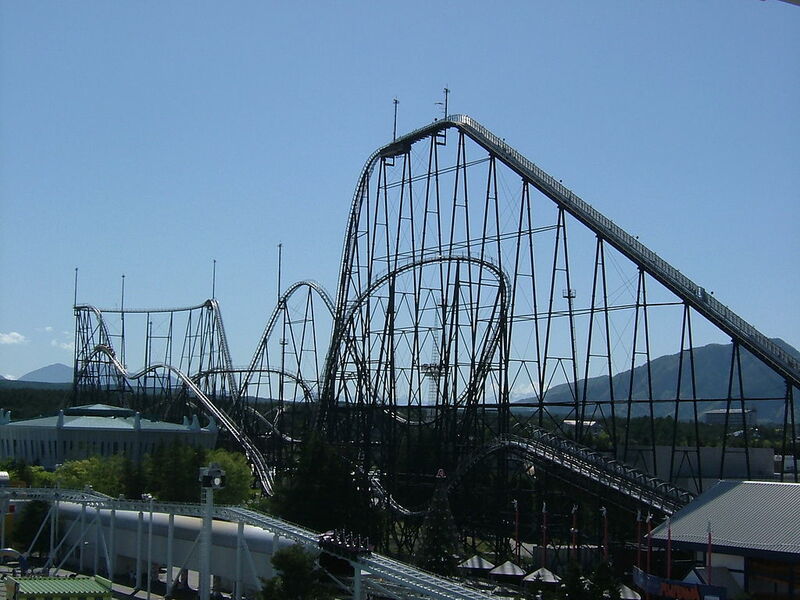 Fujiyama, a roller coaster ride was, until 2007, the highest roller coaster ride in the world — 79 meters tall. While no longer a record holder, it remains a frightening experience. 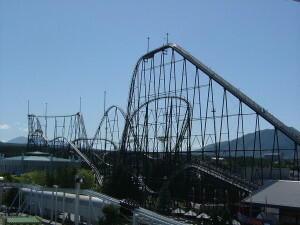 Fujiyama roller coaster ride. Photo. Another ride, Dodonpa, is also a world record holder, as the fastest ride, and as the ride with the fastest acceleration. It has lost its status as the fastest ride but holds its acceleration record. It is frequently ranked as one of the scariest rides in the world.